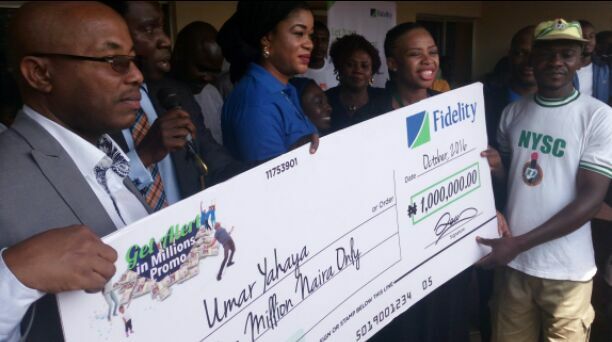 THE popular question ‘After NYSC, what next’ seems to have been answered in the case of 32-year-old Umar Yahaya, an Islamic Studies graduate of Kogi State University, Ayingba, Dekina Local Government Area of Kofi State as he emerged 3rd winner in ongoing Fidelity Bank get alert in millions promo with N1million prize. The beneficiary, who passed out of the scheme barely two weeks ago told this correspondent that, the money is coming at the best time as he was just thinking of how to raise funds to start his own business after his one year mandatory service to the country. According to Yahaya, “it was the account National Youth Service Corps (NYSC) opened for me about a year ago for my monthly allowance. When I was contacted by the bank that I won the money, I did not believe it because of massive fraud like that going on around now. But today we are here with Staff of NYSC to receive the money. That means it is confirmed. So it is real. “Well I want to invest the money in property development business which was part of what NYSC taught us. “I really want to thank NYSC for given me the platform to get this money and Fidelity bank for the opportunity given to me to have a start up capital for my business. With this money in my care, the question of after NYSC what next has been technically answered”, added Umar. In a remark, Coordinator of NYSC in the State, Muhammed Momoh urged corps members to try as much as they can to save part of their monthly allowance, saying it will save them from going back to their parents to demand for money after the service year before their dream job or business come up. He advised the beneficiary to make judicious use of the money, “N1m is a big money and it is also a small money depend on how you handle it. Thank God you have engaged in NYSC Skills Acquisition and Entrepreneurial Development (SAED) programme during the service year. “Make sure you use it as seed capital to start business that you have interest in. It is not meant for socialization but entrepreneurial development. Don’t give out any cut to anybody. Let the cut come from the proceed of the investment you use the money for. The bank has fulfill their part to establish you. So, use the money wisely to establish yourself and others around you”, he urged. Presenting the dummy check to the beneficiary in the presence of other corps members and staff or NYSC at the NYSC secretariat, Magajin-Gari, Kaduna on Wednesday, Retail Sales Coordinator, North-central, Fidelity Bank, Ifeoma Adeniyi, said it is a way of giving back to loyal savers. She said to qualify for the draw, the existing customers need to top up their account with minimum of N10,000 monthly while new account holders need N20,000 to open the saving account.